NIACL AO Mains Phase II Marks 2019 Check Here. NIACL Administrative Officer Pre Marks / Score Card Check Here. NIACL Administrative Officer Pre Result Check Here. NIACL AO Interview Letter 2019 Check Here. NIACL AO Mains Admit Card Check Here. NIACL Administrative Officer Pre Admit Card Check Here. NIACL Notification is out. 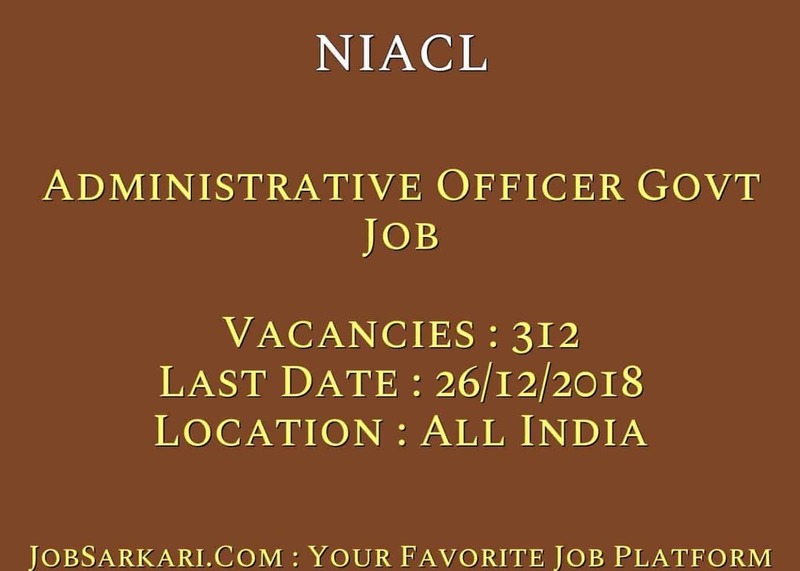 NIACL is recruiting for 312 Administrative Officer Govt Job Interview Letter 2019 Posts. 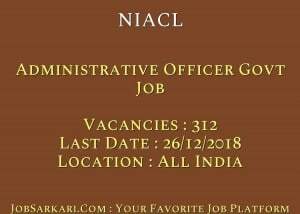 You can check NIACL - The New India Assurance Company Limited last date, download NIACL notification, visit NIACL official website and check other NIACL Vacancy details.Complete Vacancy and recruitment Details about 312 Administrative Officer Govt Job Interview Letter 2019 vacancies in NIACL are provided below by JobSarkari.Com only for you. Date of Phase - I Online Examination (Objective) 30/01/2019. Date of Phase - II Online Examination (Objective + Descriptive) 02/03/2019. Company Secretary 02 00 00 00 02. Legal 16 07 04 03 30. Finance & Accounts 20 08 04 03 35. Generalist 137 59 29 20 245. Total No of Post 175 74 37 26 312. Company Secretary Candidate Must Have Passed ACS / FCS and Graduation / Post Graduation in Any Stream With 60% Marks. Legal Candidate Must Have Passed Graduate / Post Graduate Degree in Law With 60% Marks (55% for SC / ST / PH). Candidate Must Have Passed CA and Graduation / Post Graduation in Any Stream With 60% Marks (55% for SC / ST) or ICWA and Graduation / Post-Graduation with 60% Marks (55% for SC / ST) or MBA (Fiance) / PGDM (Finance) With 60% Marks (55% for SC / ST ) or M.Com With 60% Marks (55% for SC / ST). Generalist Candidate Must Have Passed Graduation / Post Graduation in Any Stream With 60% Marks (55% for SC / ST / PH). English Language 30 20 Minutes. Reasoning Ability 35 20 Minutes. Quantitative Aptitude 35 20 Minutes. 6.Online Application Can be Submitted on or Before 26th December 2018. Q. What is the Last Date For NIACL Administrative Officer Govt Job Interview Letter 2019 Vacancy ? A. Last Date for NIACL Administrative Officer Govt Job Interview Letter 2019 Posts is 26/12/2018. Q. What is the Form Type of NIACL Administrative Officer Govt Job Interview Letter 2019 Recruitment ? A. The Form Type for NIACL Administrative Officer Govt Job Interview Letter 2019 Posts is Online. Q. How many vacancies are available in The New India Assurance Company Limited Administrative Officer Govt Job Interview Letter 2019 Posts ? A. There are about 312 Vacancies in The New India Assurance Company Limited Administrative Officer Govt Job Interview Letter 2019 Posts. Q. What is the Full Form of NIACL ? A. Full Form of NIACL is The New India Assurance Company Limited .